Veteran launch photographer Ben Cooper captured this spectacular photo of NASA's LADEE moon probe soaring across the night sky from Top of the Rock, Rockefeller Center, in New York City, about 200 miles north of the launch pad at NASA's Wallops Flight Facility on Wallops Island, Va., on Sept. 6, 2013. A Minotaur V rocket launched the LADEE probe at 11:27 p.m. EDT. NASA's spectacular nighttime launch of a new moon probe late Friday (Sept. 6) promised to amaze spectators up and down the U.S. East Coast. By all accounts by photographers and SPACE.com readers, it lived up to the hype and then some. 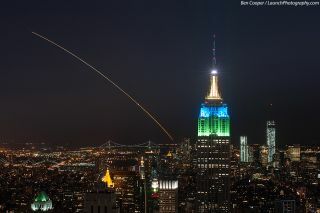 Photos of the dazzling NASA moon probe launch poured into SPACE.com from readers and photographers in New York City, Massachusetts, New Jersey and more. The new robotic LADEE moon probe launched into spaceFriday atop a new Minotaur V rocket at 11:27 p.m. EDT (0327 Sept. 7 GMT) from NASA's Wallops Flight Facility on Wallops Island, Va., creating a brilliant night sky spectacle visible from hundreds of miles away. "I planned this months in advance and made a trip up to coincide with it (my family is up here) … From the Top of the Rock observation deck, the Minotaur was due to pop above the horizon from just left of the Empire State Building, a trajectory I calculated back in June," Cooper said of the 55-second exposure. "I was amazed from 200 miles away at how bright it was, and how fast, though Minotaur is one of the fastest launch vehicles. The clarity in the atmosphere made it amazing even with light pollution. After covering 110 launches before this, this was my first where I was any further than even 10 miles away." Quentin Le Fevre was in Jersey City, N.J. when he captured this view of NASA's LADEE moon mission launch on Sept. 6, 2013. In Jersey City, N.J., skywatcher Quentin Le Ferve captured amazing launch streak views of LADEE soaring overhead, with bright city lights and bridges serving as a stunning backdrop. From my home in northern New Jersey, 12 miles south of New York City, the LADEE launch looked like a brilliant red-orange streak soaring spaceward. The separation of one of the rocket's five stages and ignition of another, a major milestone in the ascent, was clearly visible. Meanwhile, photographer Ben Gallop captured a serene time-lapse view of the launch from Jennettes Pier in Nags Head, N.C. You can see more amazing LADEE launch photos by SPACE.com readers here. Photographer Ben Gallop snapped this serene view of NASA's LADEE moon mission launch from Jennettes Pier in Nags Head, N.C., on the night of Sept. 6, 2013. The mission launched on a Minotaur V rocket from NASA's Wallops Flight Center on Wallops Island, Va.
NASA's $280 million LADEE moon mission will take an unprecedented look at the moon's thin atmosphere and study how lunar dust moves over time. Scientists hope the mission will offer insight into 40-year-old mysteries of moon dust first observed by NASA Apollo astronauts during the lunar landings in the 1960s and 1970s. The public interest in the LADEE mission appears to be high. NASA officials said crowds watched the launch from Times Square in New York City (it was broadcast live on the giant screens), as well as from the steps of the Lincoln Memorial. "The launch turned the hashtag #NASA into the top trending topic on Twitter in the U.S. late Friday. The launch coverage on NASA TV went out in 66,000 webcast streams," NASA officials wrote in an update. "For the first time that the NASA.gov team is aware of, the majority of peak traffic to the site for a live event came from mobile devices instead of desktop computers." Skywatcher Sean Sullivan captured this view of NASA's LADEE moon probe launch over the Charles River in Cambridge, Mass., on Sept. 6, 2013. LADEE launched from Wallops Island, Va., and was visible from much of the U.S. East Coast. At the Wallops Flight Facility alone, a crowd of 1,100 spectators packed the visitor's center to watch the moon shot. Across the country, at NASA's Ames Research Center in Moffett Field, Calif., another large crowd watched the launch on screens to cheer the mission on. NASA's Ames center will serve as mission control for the LADEE spacecraft. In Oneonta, N.Y., stargazers Jessica Guenther and her husband Dan Decker were overjoyed at being able to see LADEE begin its voyage to the moon. "We have been practicing our night sky photography for the last few weeks and were so excited to be able to capture the launch!" Guenther told SPACE.com in an email. "This is the only launch into space we have ever seen, we were so excited we couldn't even contain ourselves! All we kept saying was 'Wow, I can't believe we got to see a rocket to the moon!'" NASA's Friday night LADEE moon launch marked the first flight of a Minotaur V rocket built by the commercial spaceflight company Orbital Sciences Corp. Shortly after the successful launch, the LADEE spacecraft experienced a glitch with its reaction wheels, which are used to orient the probe in space. NASA engineers are studying the issue in order to develop repair plans, agency officials said. Editor's note: Did you see LADEE and Minotaur V in the night sky? If you took a photo of the LADEE launch or any other night sky view that you'd like to share for a possible story or image gallery, send photos, comments and your name and location to managing editor Tariq Malik at spacephotos@space.com.